Caregiver Products is proud to offer PenAgain® writing instruments made by Baumgartens. Pencil lead refills package of 5. 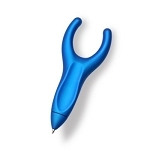 Eliminates the need to grip the pen or pencil.